2. Nicer whitening effect, 5-8 steps (VITA) to be boosted for one period of treatment. 3. 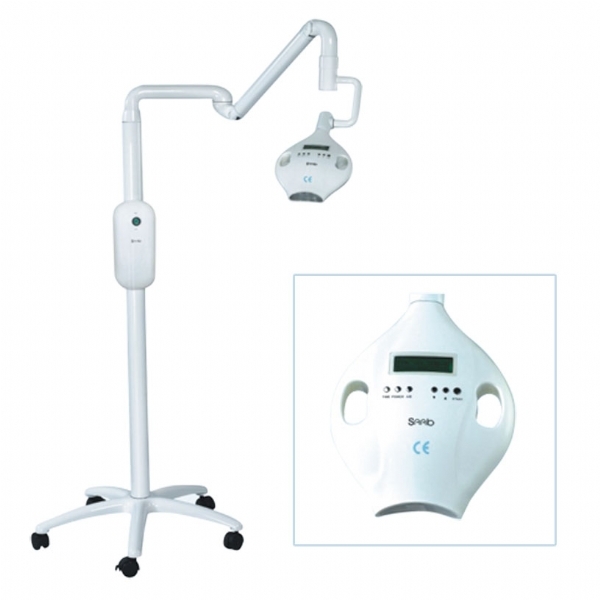 Specialized whitening cold blue lights, low heat remain to ensure the patient’s comfort. 6. Advanced operation interface, with great convenience and facility. 7. Multi-Security design, guarantee the safety of patients and doctors. It is completely safe, because unlike some other whitening lights on the market, it emits no harmful Ultra-Violet (UV) rays. Instead, the light operates in a narrow wavelength range of the gentle blue spectrum and is perfectly safe for teeth, gums, and skin. Its whitening light consists of several specially advanced LEDs that produce precise output in the blue-green spectrum of 460-490 nanometers, which is the most effective range. In just over an hour, your teeth will be dramatically whiten, results range from 8 shades up to 12 shades per session. It is ideal for anyone looking for immediate results. The convenience of ours in comparison to weeks of wearing uncomfortable trays and gradual whitening makes it the perfect choice for today's busy individuals. The "Whiten" button initiates the tooth whitening procedure. As the whitening LEDs are turned on, the LCD display's timer will start the countdown. The preset default whitening duration is 15 mins, cycle through the available durations by pressing the "SET TIME" button, each press will add 1 min, and the maximum is 30 mins. At any time during the whitening process, the user will be able to pause the procedure at any time by pressing the "Pause" button.